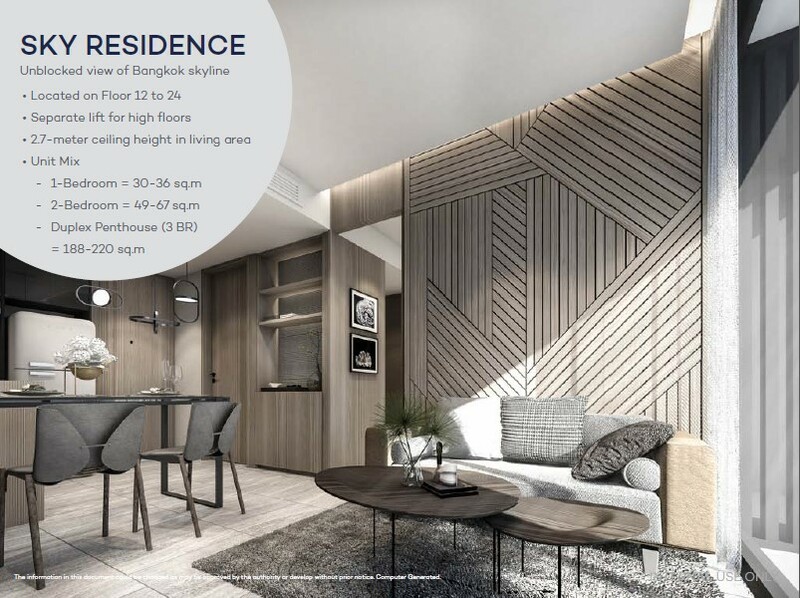 Telling that this is one of the most interesting condominium in the middle of the city, near a lot of various facilities like traffic route near BTS-system and public transport, famous restaurants and also surrounded by famous shopping malls that both Thai and foreigner used to visit. 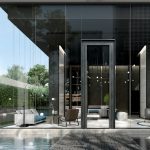 This area is today vary popular among a lot of the investors and will also be more attractive in the future because it still growing in each day. 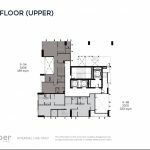 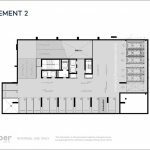 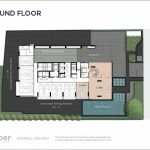 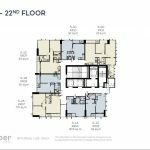 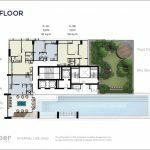 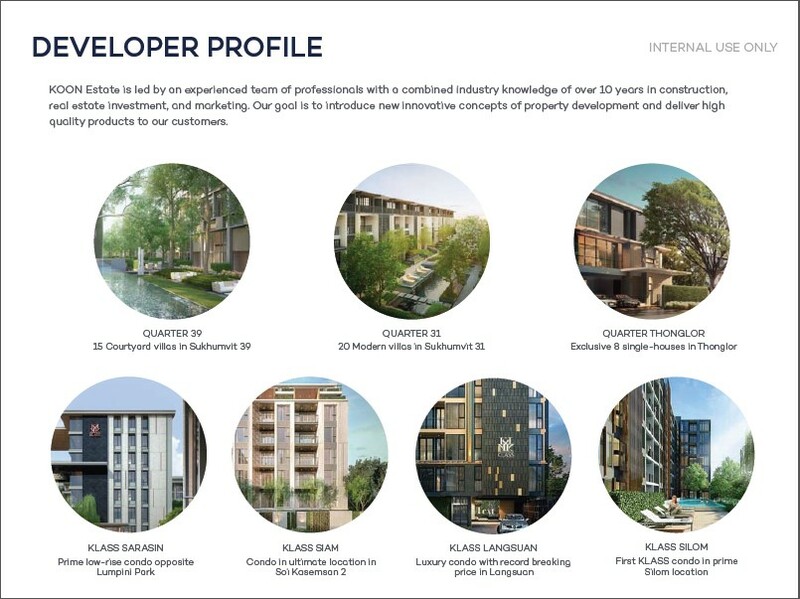 And now we would like to present the distinctive point and interesting information of the project and ready to show the interesting floor plan to everyone. 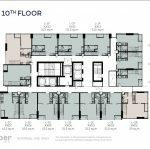 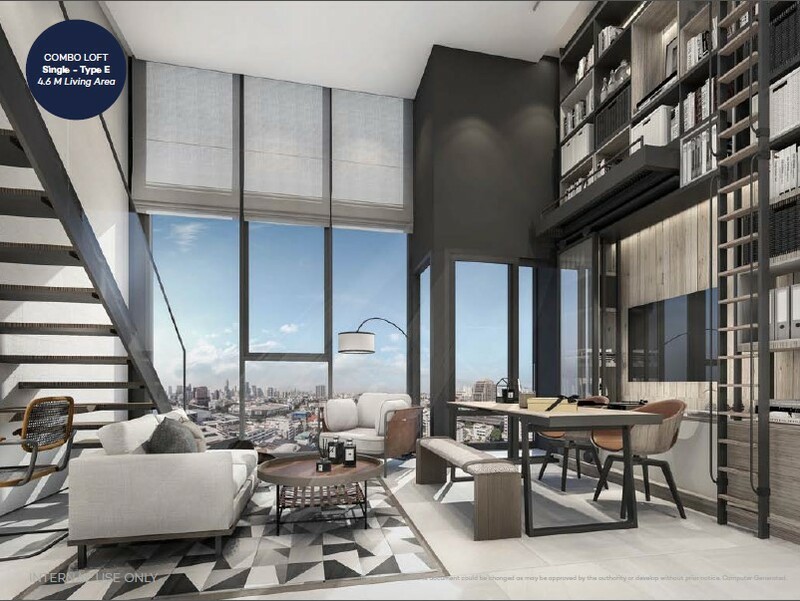 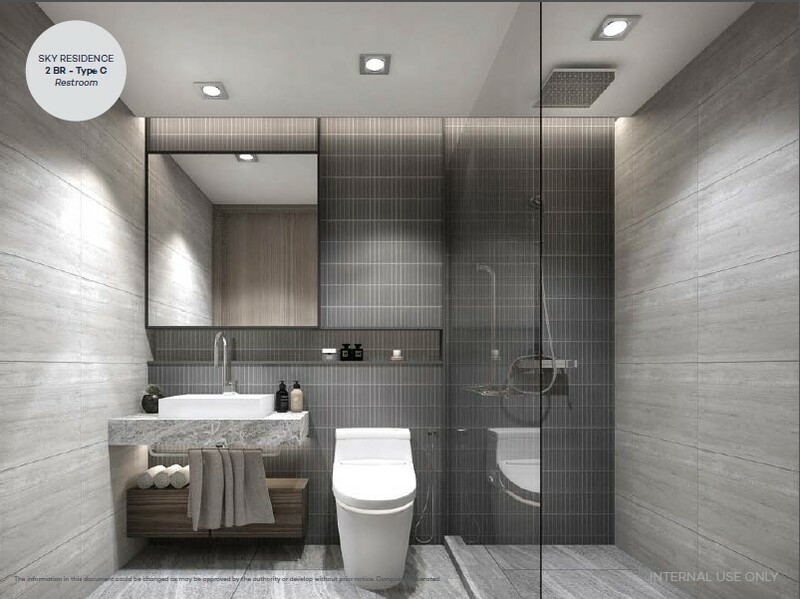 BTS สนามกีฬาแห่งชาติ Distance 700 m.
Let see the Floor Plan of Cooper Siam, condominium in SOHO–style for you to an easy investment on location on Siam–Chula. 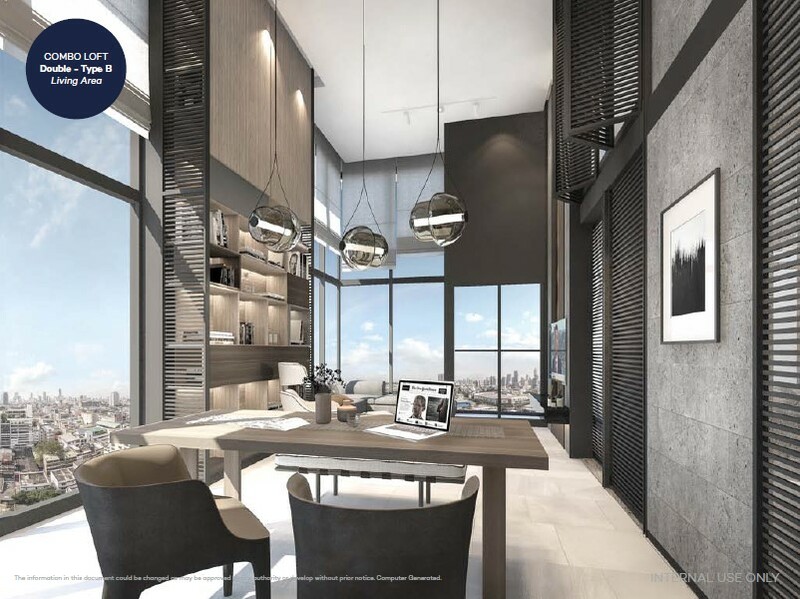 The ceiling height at 4.6 meters with the starting price at only 4 millions. 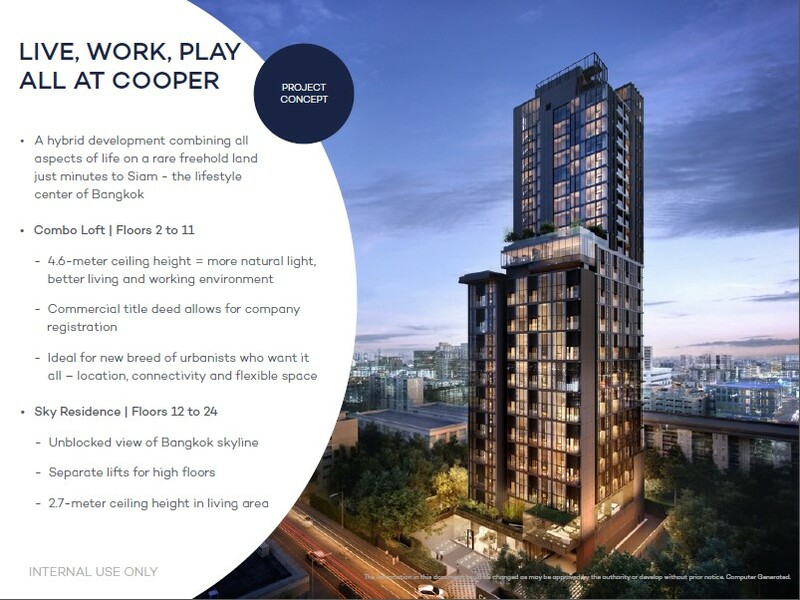 The COOPER SIAM is throwing away all the concepts that appeared before by taking the concept from big cities around the world to develop and then using it in Thailand for the first time to answer the lifestyle and behavior of people in the 4.0 era and Gen Y-people to have more freedom in their life. 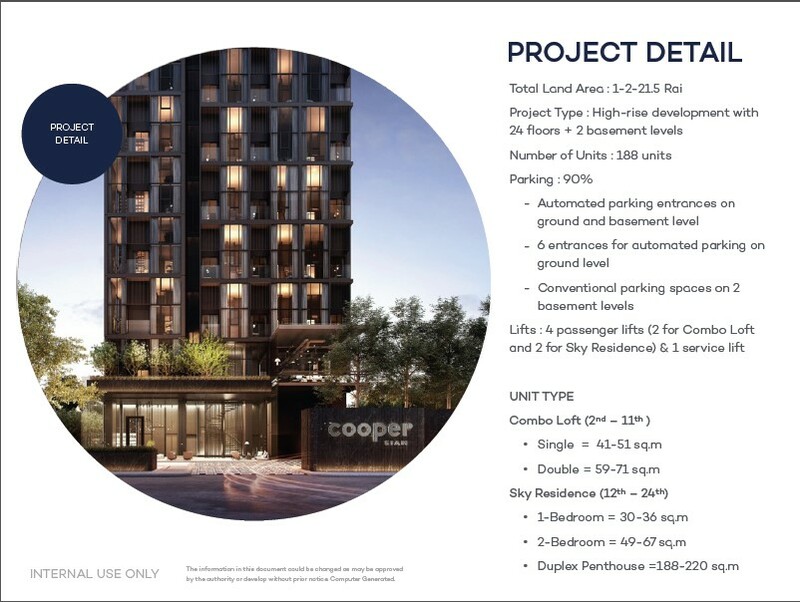 The COOPER SIAM is the only High Rise Condo in the area of BTS-National Stadium-Banthadthong-Rongmuang, with the total area of 1-2-21.5 area with only 188 units. 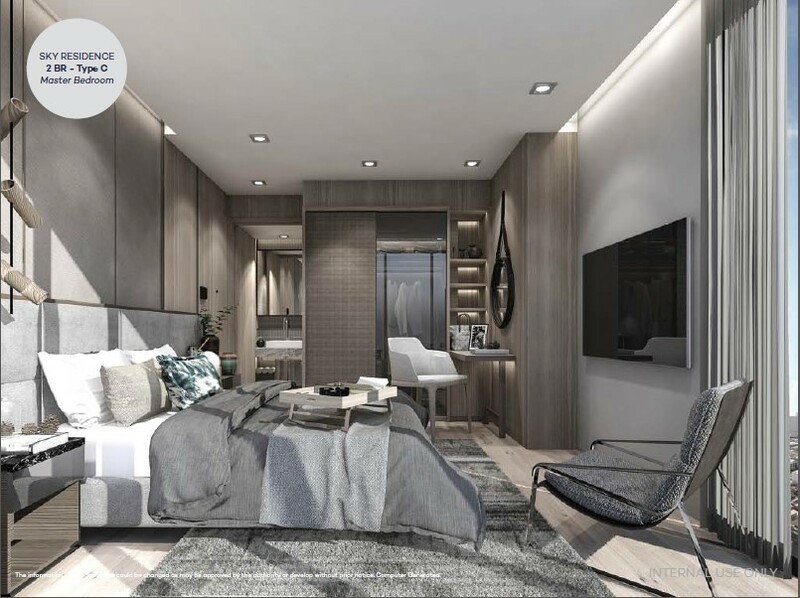 Divided into a Combo Loft-zone as Single Room and Double Room in the size of 41-71 square meters, high rise residences or Sky Residence as 1,2 bedrooms of 30-67 square meters and Penthouse Duplex 3 bedrooms of 188-220 square meters with the total value of the project at almost 1,300 millions bath. 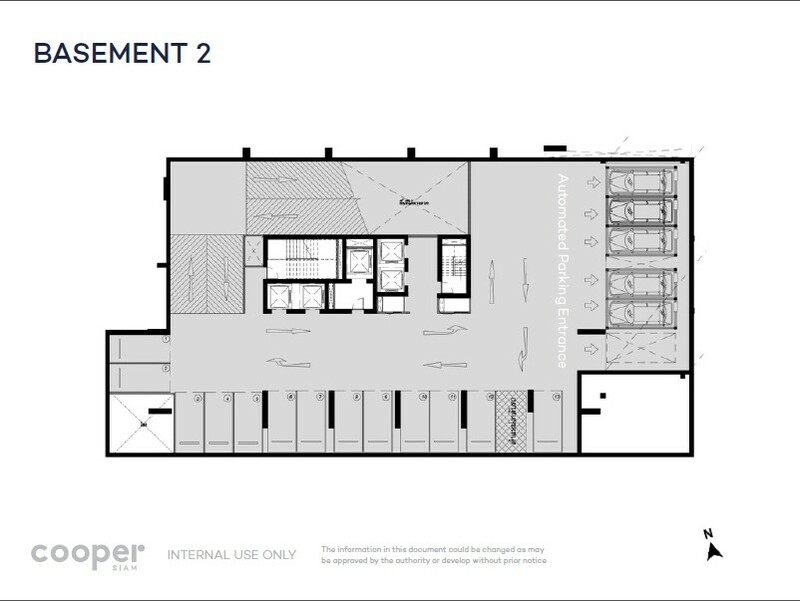 With the parking lots of almost 90% mixed between Automatic parking and simple parking by having 6 parking lots as auto–parking at the G–floor. 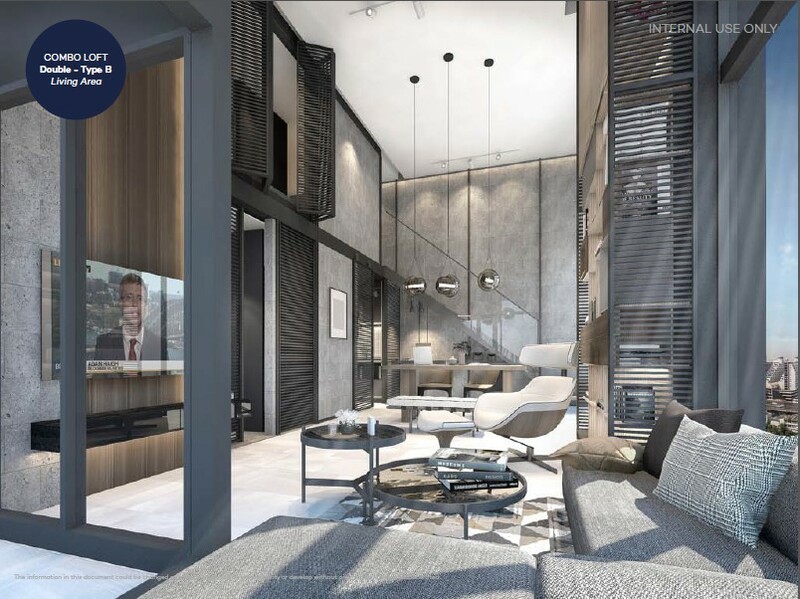 If you are looking for a condominium with a lot of parking spaces in the area of Siam-Samyan-Chula-Ratchathewee, this condo is the one you should choose. 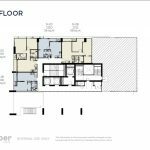 And the concept of this project is Lofts that Work. 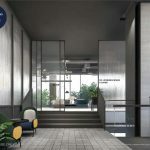 It means that the buyer can modify the condo into a company, it will say that they can register their own company like a normal house or Home Office. 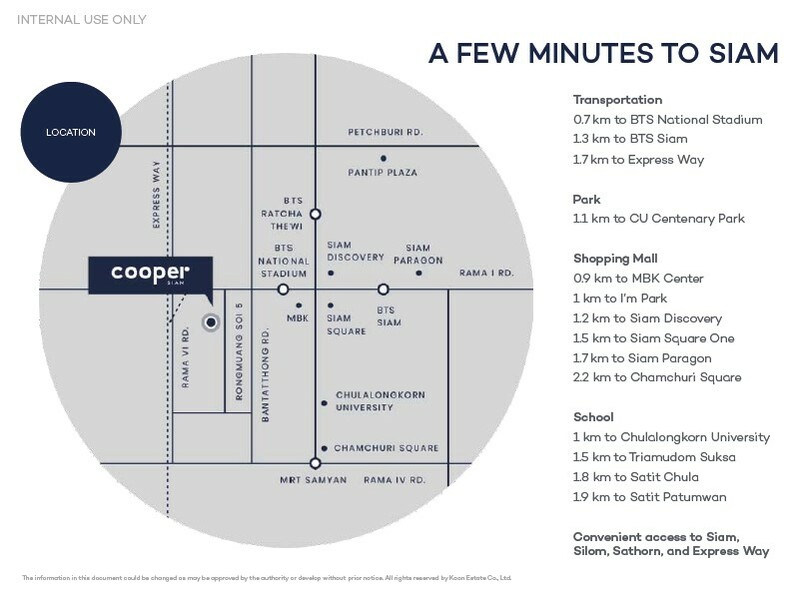 It takes less than 10 minutes by car and you can shop and chill at Siam. 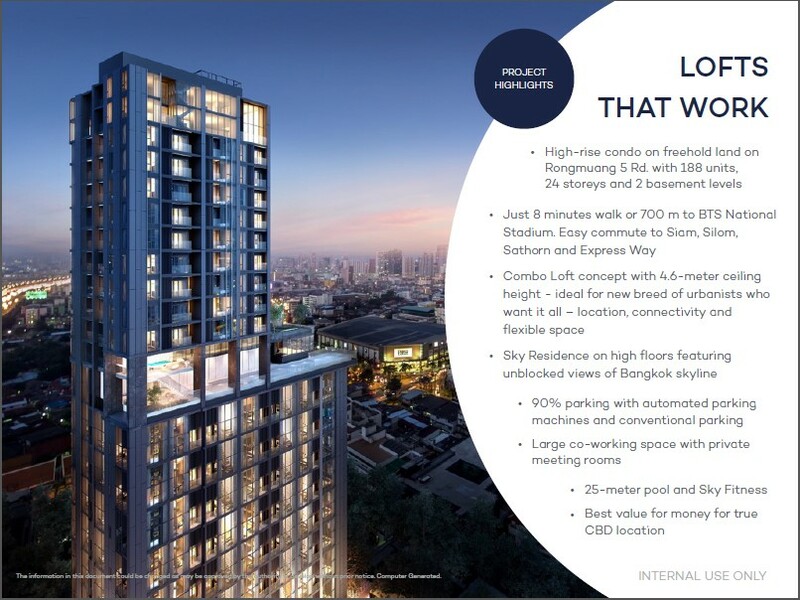 Or you can walk and see it like a training at the same time, because the project is located only 700 meters away from BTS-National Stadium Station. 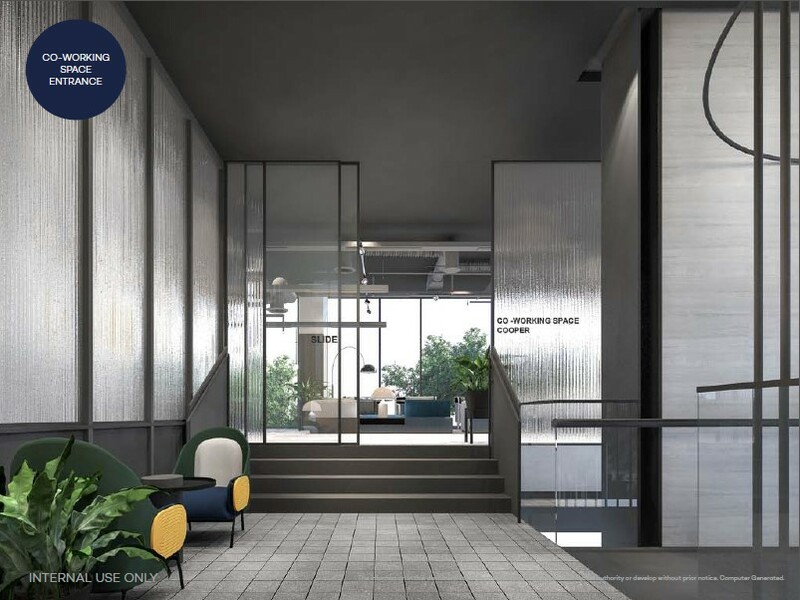 This concept is calls SOHO as Small Office Home Office which is very popular in Singapore and condo with SOHO style in Thailand marked today is only The Emporio Place SOHO (South building) at Sukhumvit 24. 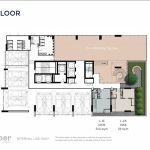 The project have divided the living zone by the using purpose. 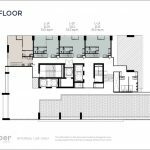 For example if you want to use it like an office, you can choose 2-11 floor that have the room in Combo Loft style with both 1 bedroom and 2 bedrooms. 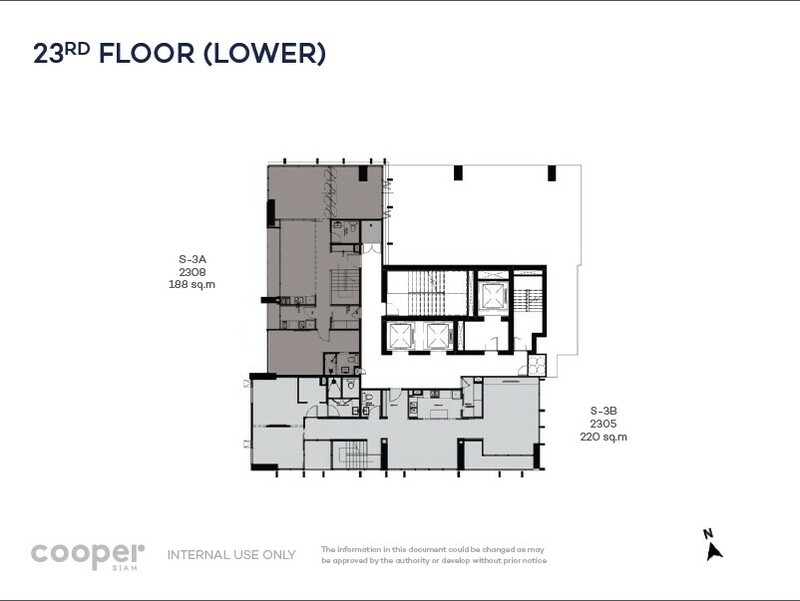 The rooms in loft-style are differenced from the Duplex rooms because there are 2 entrance at both 2 floor. 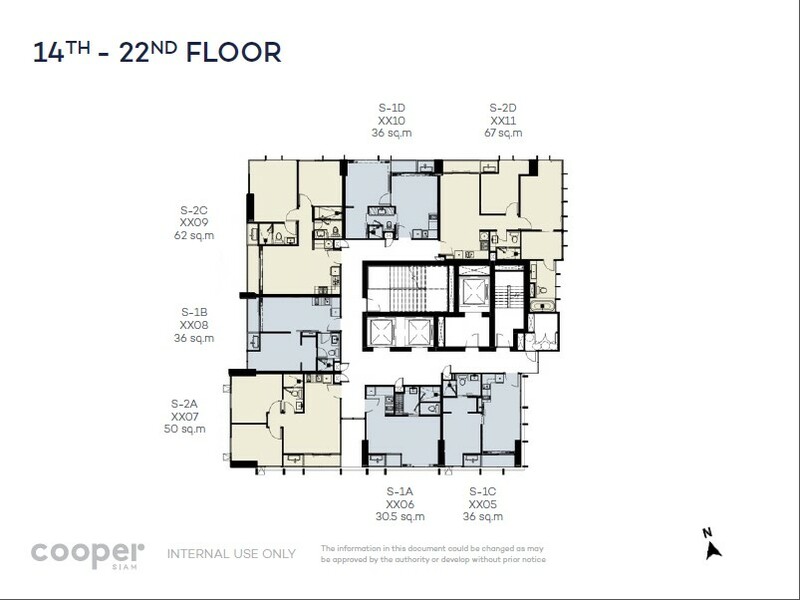 For example, if the room appear on 20th-21st floor, the buyer can choose to entre on which floor they want. 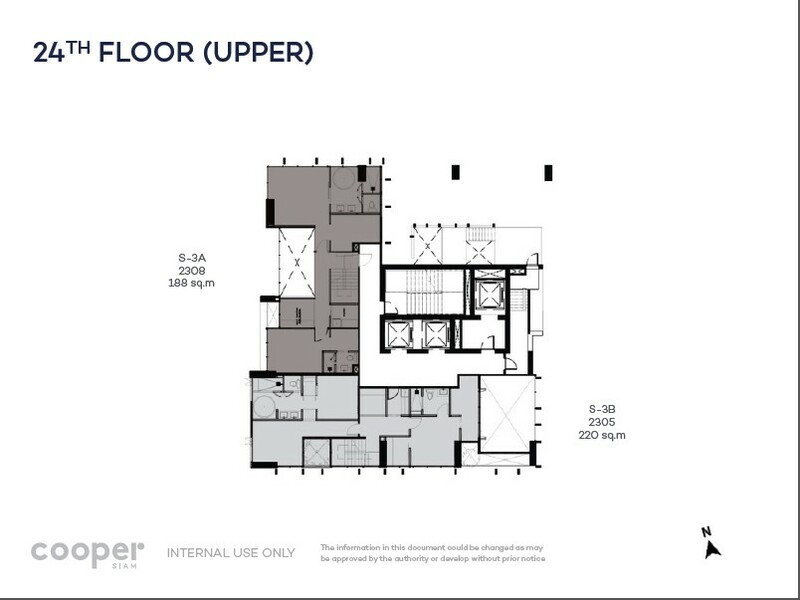 And the ceiling height from floor is higher than the loft rooms because there are 2 floor in duplex room. 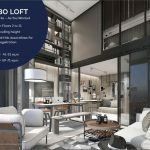 While there is only one entrance in the loft room. 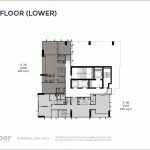 And the upper floor, they are adding another construction making a mezzanine and the ceiling height is lower than the duplex room. 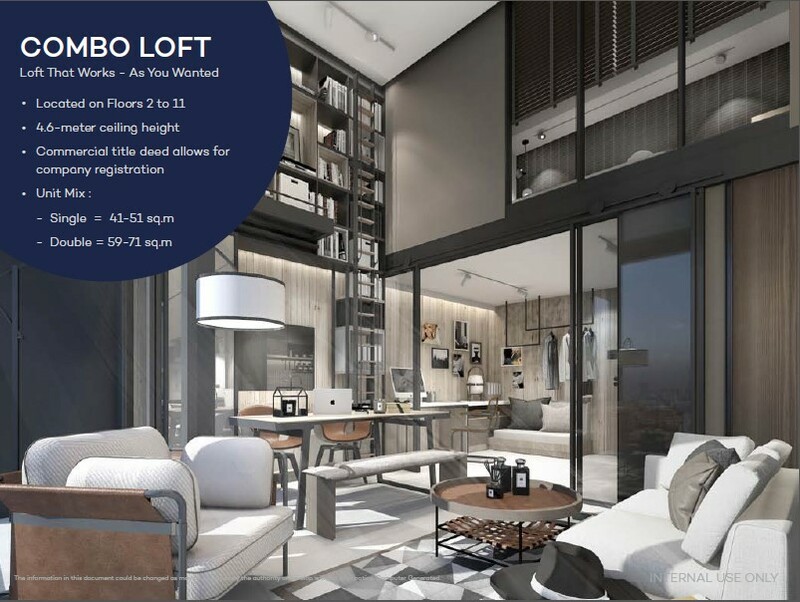 The Living area of the loft room. 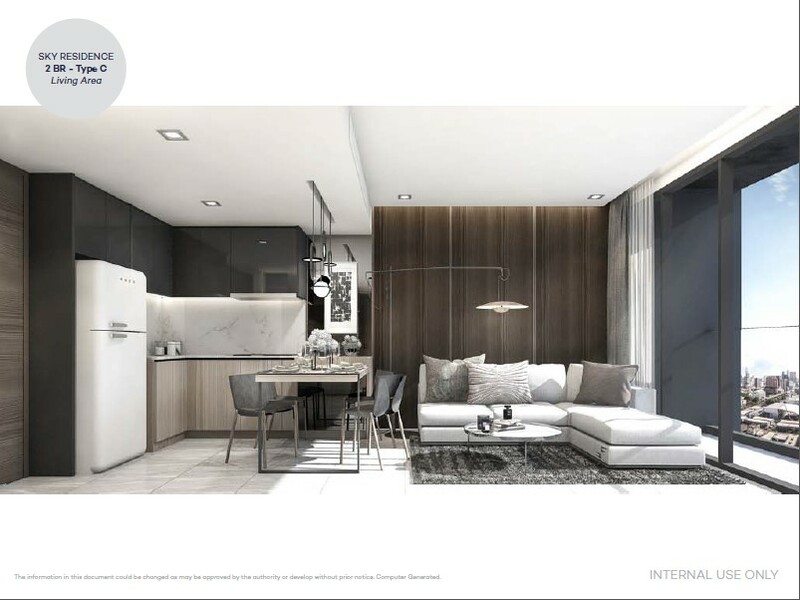 Another view of the Living Area. 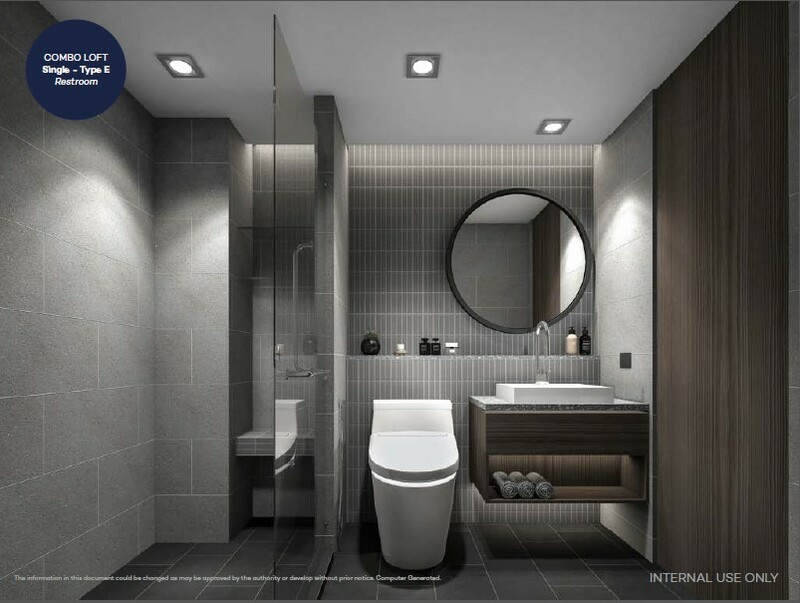 Toilet of the loft room. 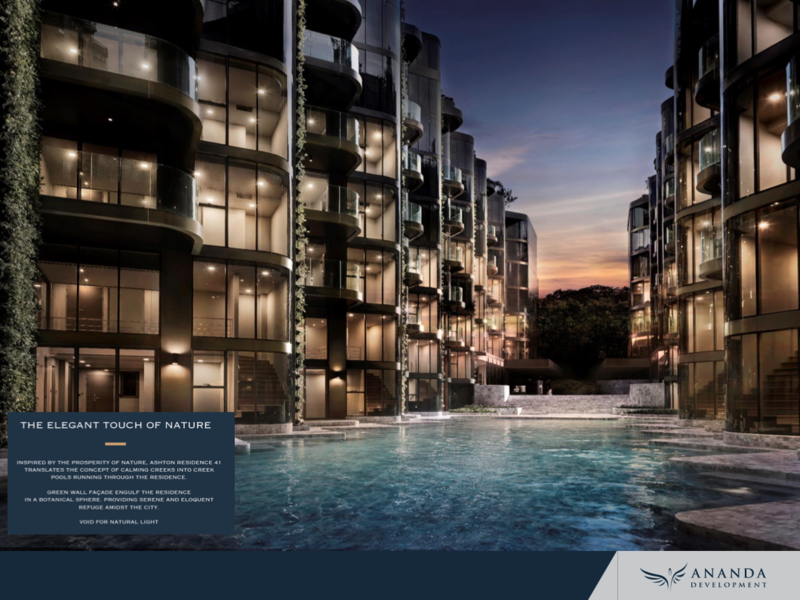 For you who wants to buy and using it as a living residence with beautiful view like a long swimming pool and Supachalasai stadium. 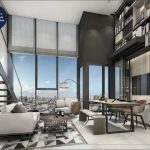 The room in Sky Residence zone at the east side with number 05 is the room that have the most beautiful view, because the room is small but the view is in the premium grade that is most difficult to find in the marked of the city. 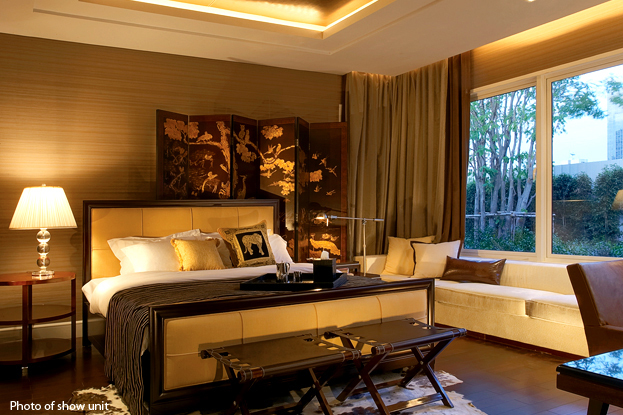 The Master Bedroom in Sky Residence zone. 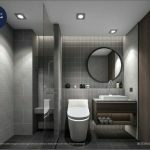 Toilet in Sky Residence zone. 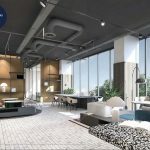 The Living Area in Sky Residence zone. 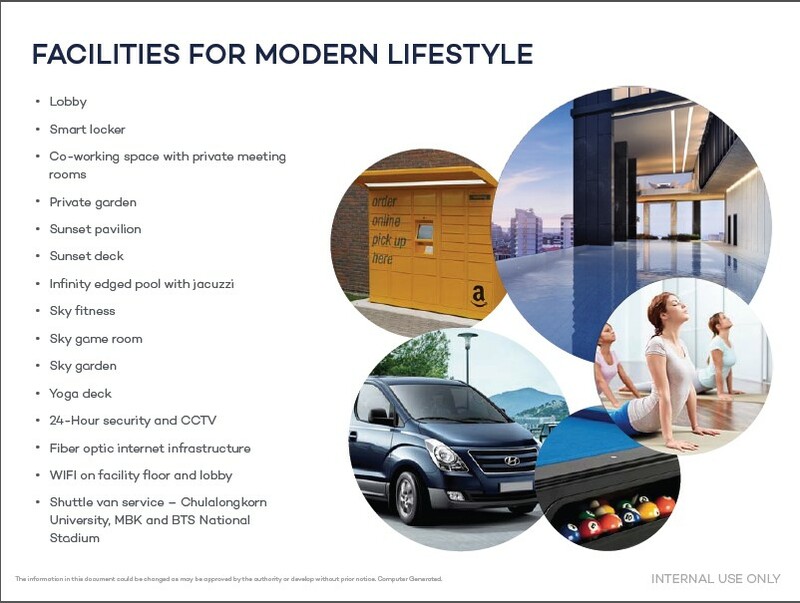 And the facility area was designed to serve various lifestyles of people in Gen Y which have a lot of freedom, open minded and also various cultures, that will serve both of the living and also working at the same times. 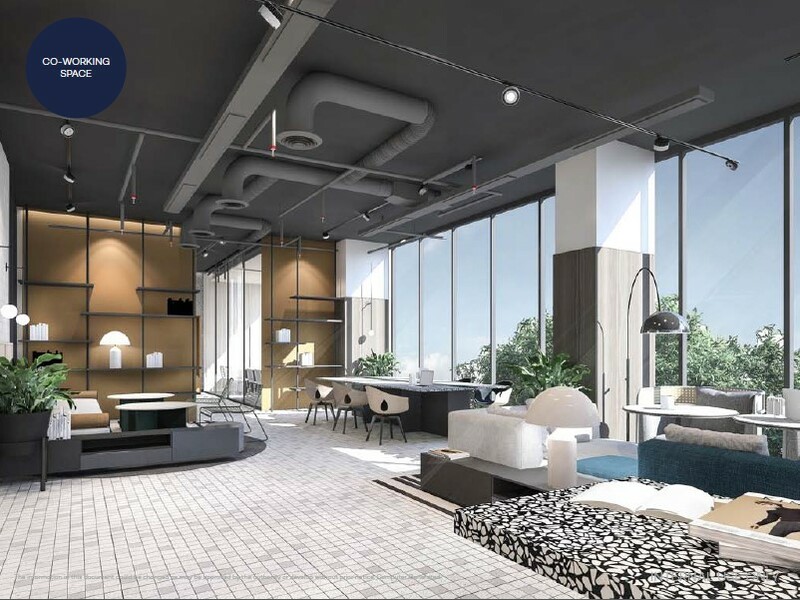 With fully facilities like Co-working space, privet meeting room and a multi-room, a view pavilion, swimming pool with a Jacuzzi, fitness center, game center room and a sky garden. 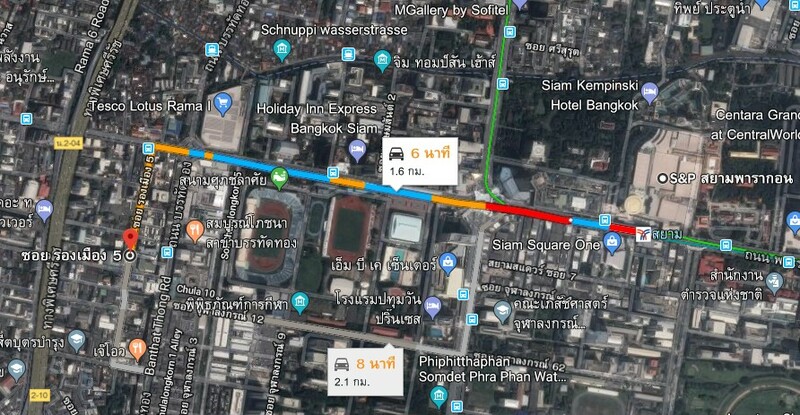 Adding some more conveniences with a shuttle bus to various stations like Chulalongkorn University, MBK-center, Siam Square and BTS-National Stadium Station. 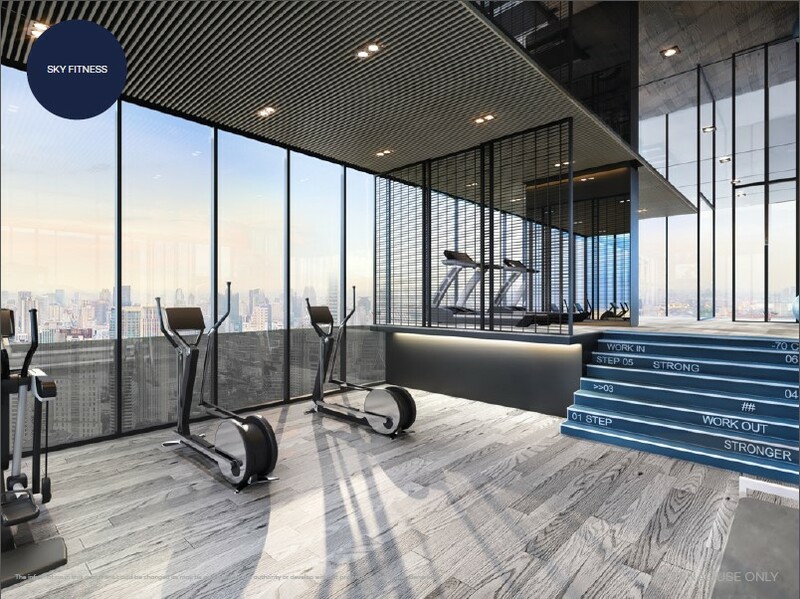 The ceiling height of the lobby was added to be higher to be more airy with glass window to get all the view from the outside the building. 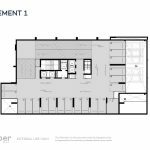 Co-working space is really big and can support a lot of the residents. 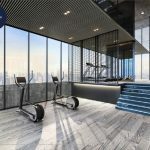 The fitness center is also really big and you can get beautiful view of Bangkok by the fully glass windows and get nothing to block the view you get. 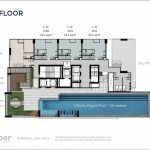 The swimming pool with Jacuzzi that you can swim and satisfy the view at the same time. 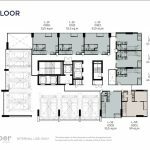 Let’s see the floor plan for each floor and see how they look like and what their distinctive points they really have. 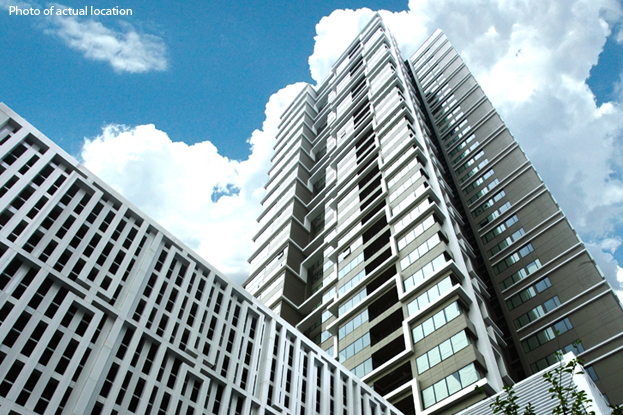 The main entrance is turn to Rongmueng 5 Road and the building is laid along the side of north and south. 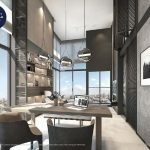 There are also 6 automatic parking lots, the first one with most automatic parking lots in Bangkok Condo-market right now. 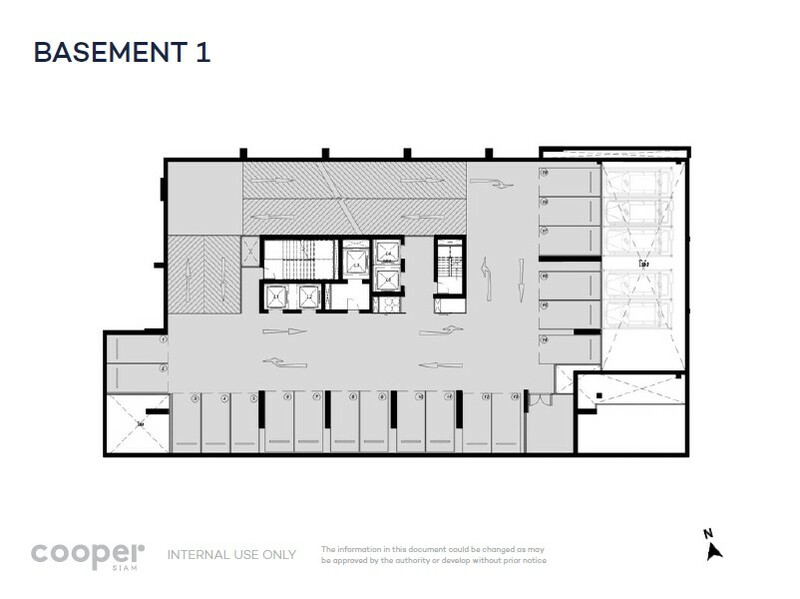 The parking area in the basement. 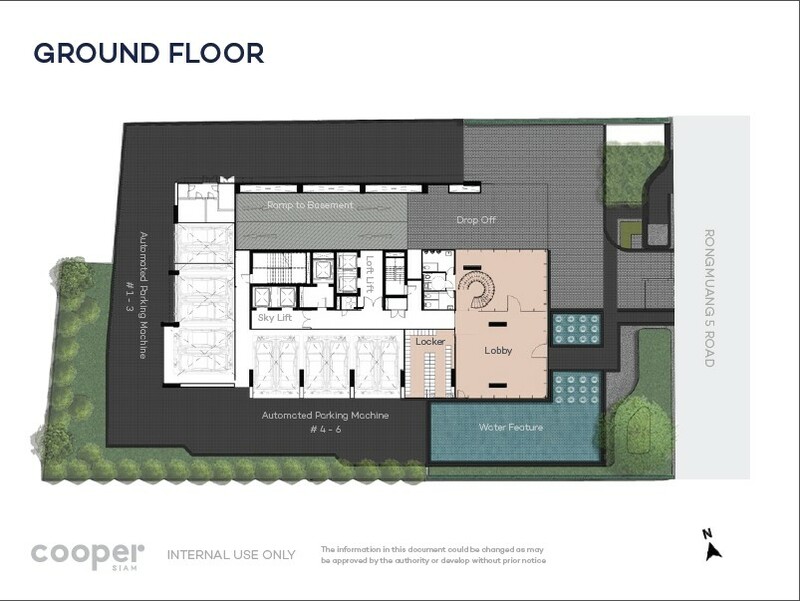 Automatic parking area with 6 parking lots. 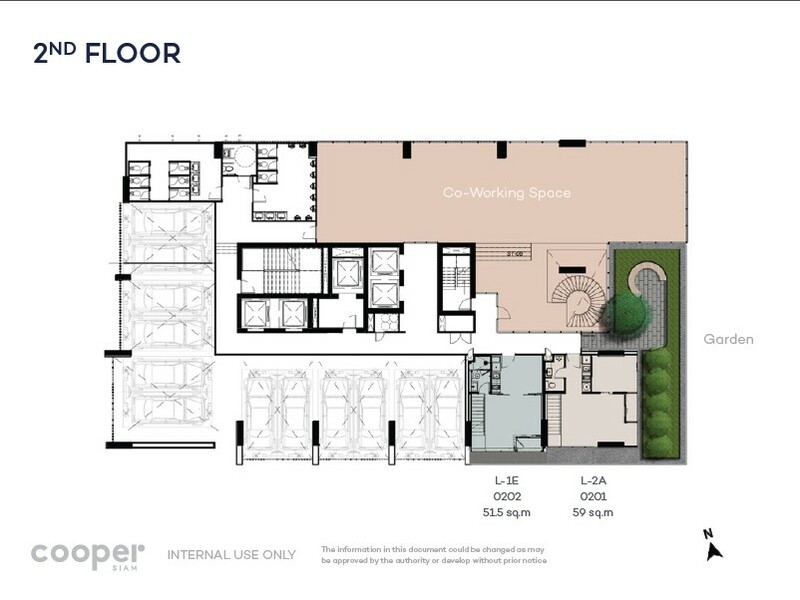 The area on 2nd floor is an area of Co-working space area and there is also a little garden outside the area. 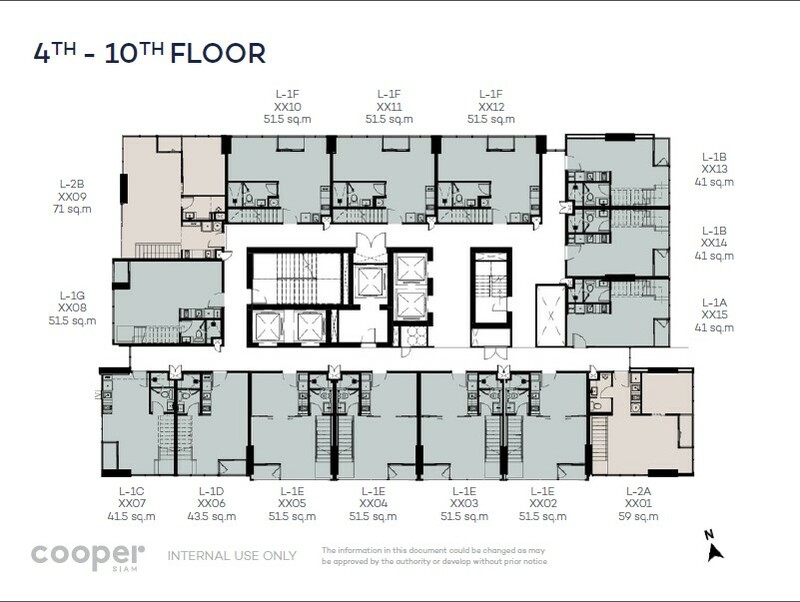 On the 3rd floor is mostly the living area which only have 8 private units. 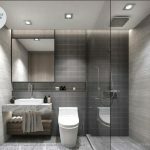 The smallest room are about 41 sq.m. 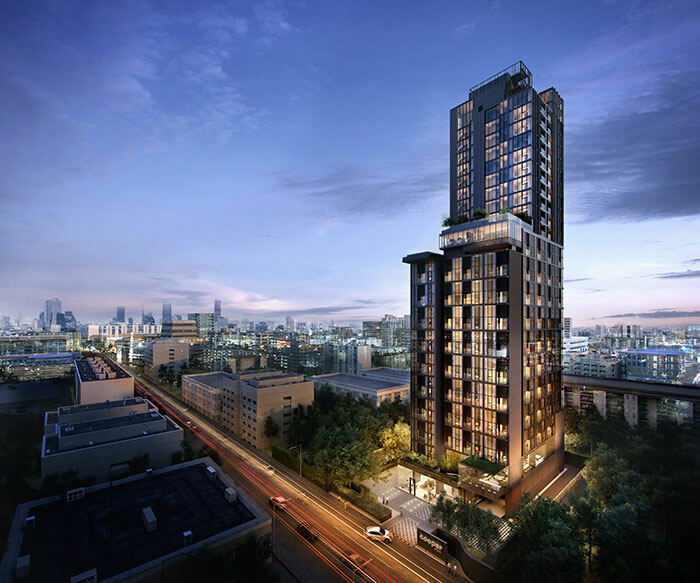 and are located on the east side. 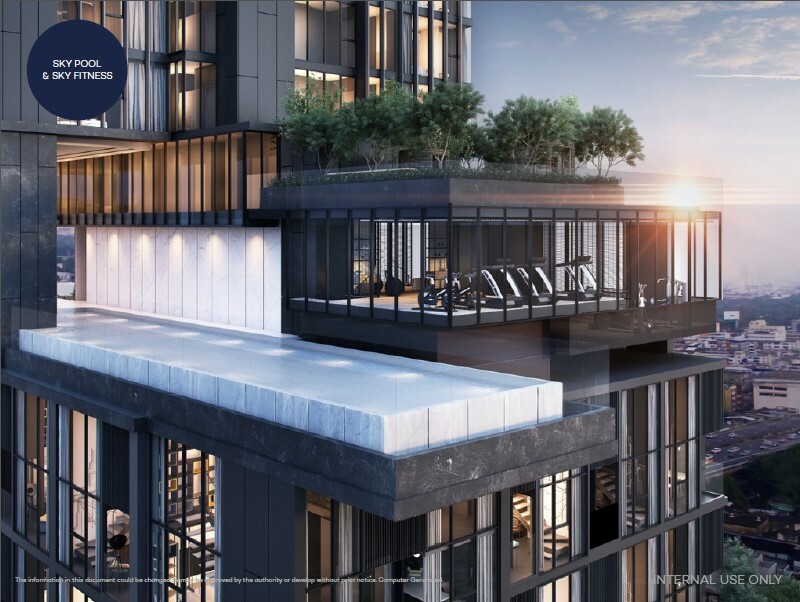 The most popular side is on the east, because you can see the beautiful Suphadchalasai-Stadium from here, with the rooms of 41.5-59 sq.m. 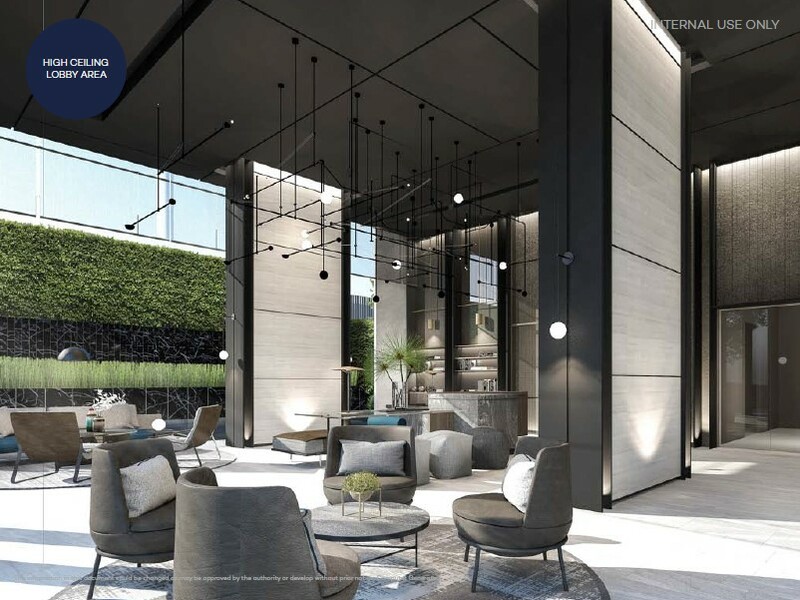 at the corner. 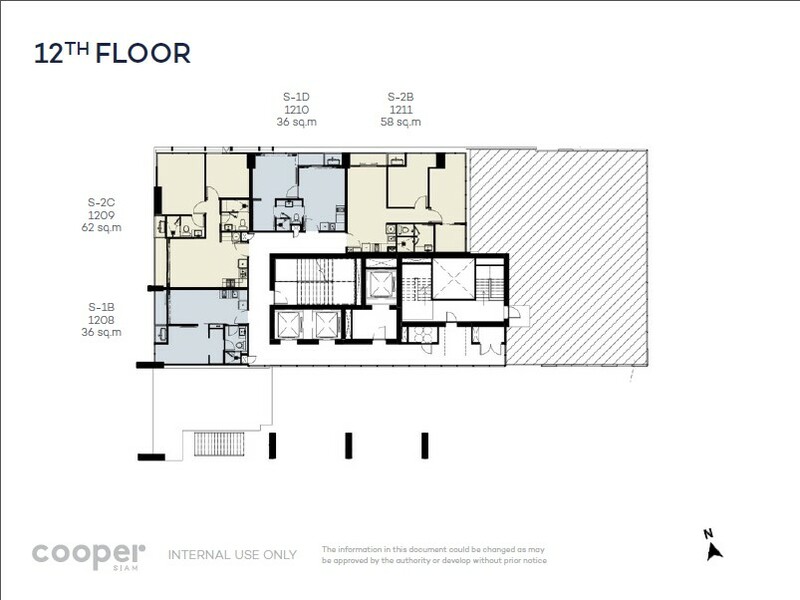 And the biggest room is room number 9 with the size of 71 sq.m. 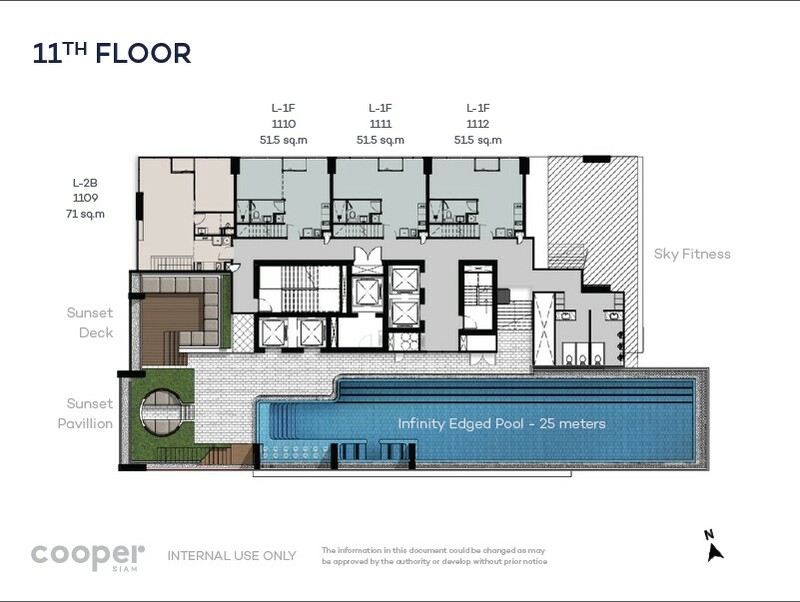 The central facility area is on the 11th floor with the highlight of a 25 meters long swimming pool and only 3 living rooms on this floor. 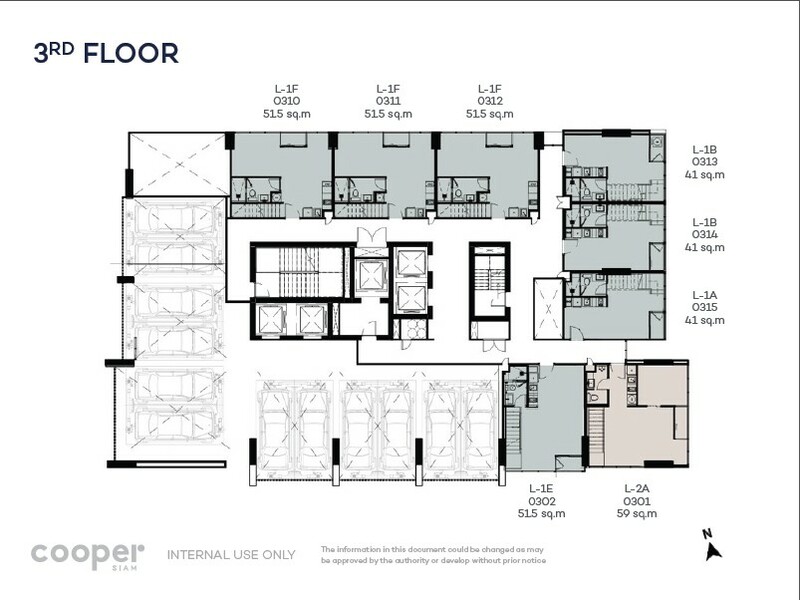 At the Cooper, on the 12th-24th floor are the standard rooms with the ceiling height at 2.7 meters. 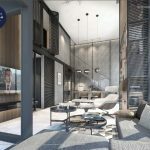 But they have a distinctive point of only being as living residences with higher views, really good for those who wants to live their peaceful life or for those who already have a combo loft room to run their business and wants to buy another room up here to live too. 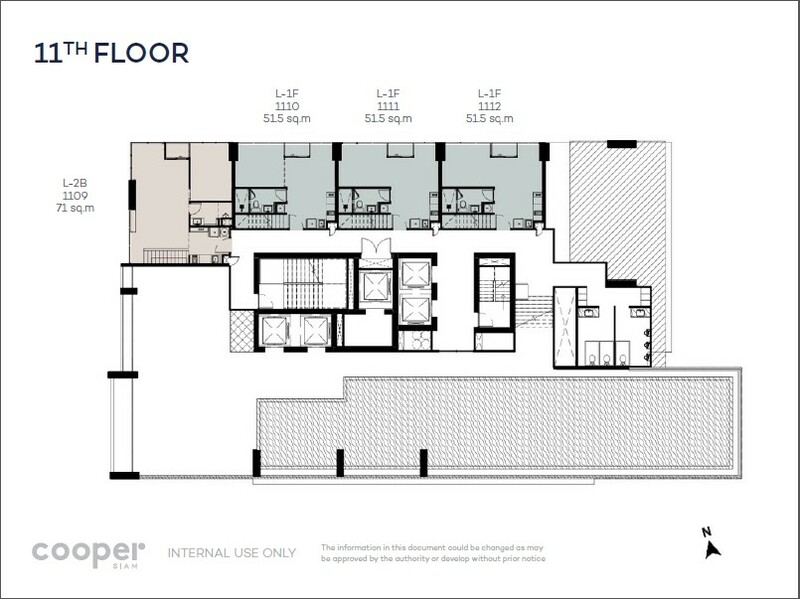 On 23rd-24th floor are only 3 penthouse duplex of 188-22- sq.m. 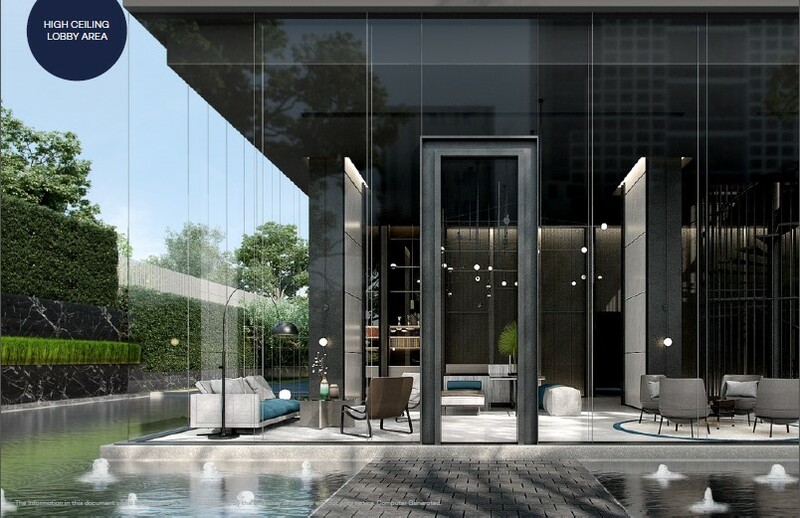 with private elevator. 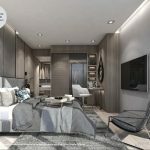 Inside the room was design to give a lot of freedoms to the residents to modify by themselves to fit their own lifestyle with high grade materials that have their own entity and luxury style. 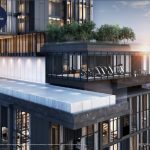 The developer of the project COOPER SIAM is Koon Estate Co., Ltd, company that first started with development of living residences and have developed projects in Sukhumvit area of Quarter-brand like single houses Quarter Thonglor, Quarter Sukhumvit 39 and Quarter Sukhumvit 31 Cluster House. 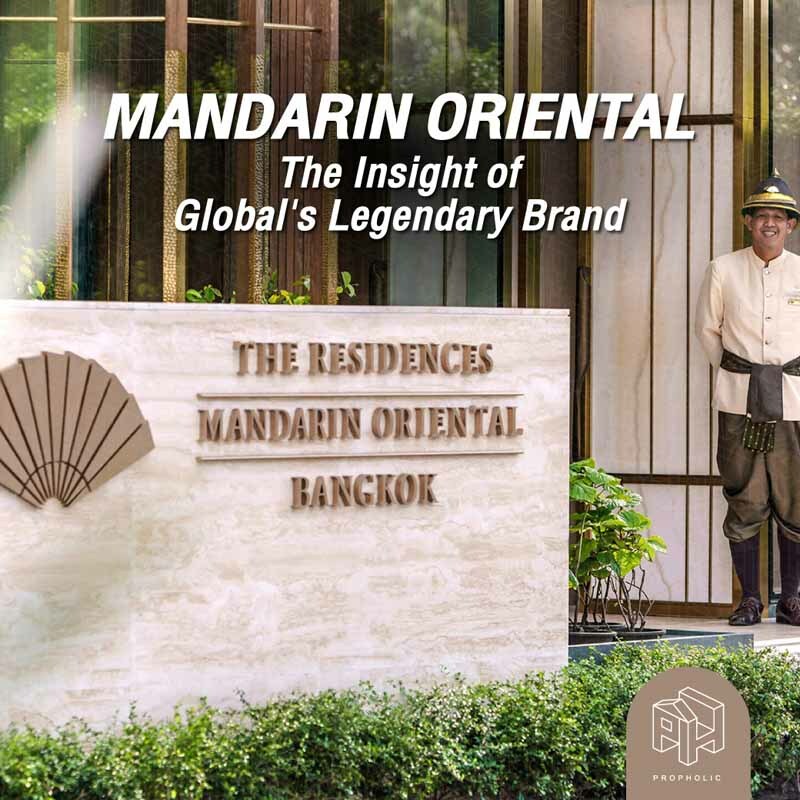 And they have had a partnership with Narai Property Co., Ltd to develop the last 3 projects. 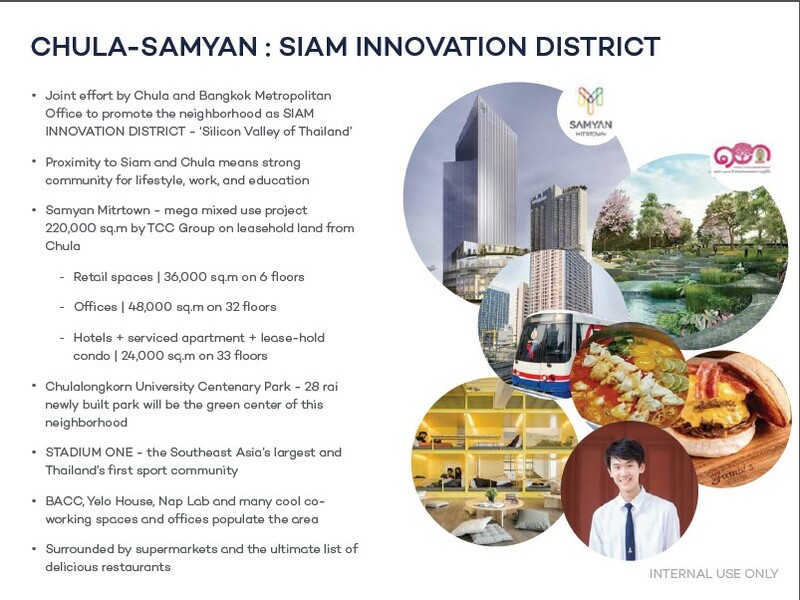 The COOPER SIAM is the first project that they 100% develop by themselves. 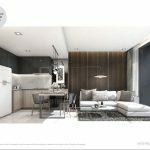 And the project consultants of architect and Interior Design is makeAscene Co., Ltd. 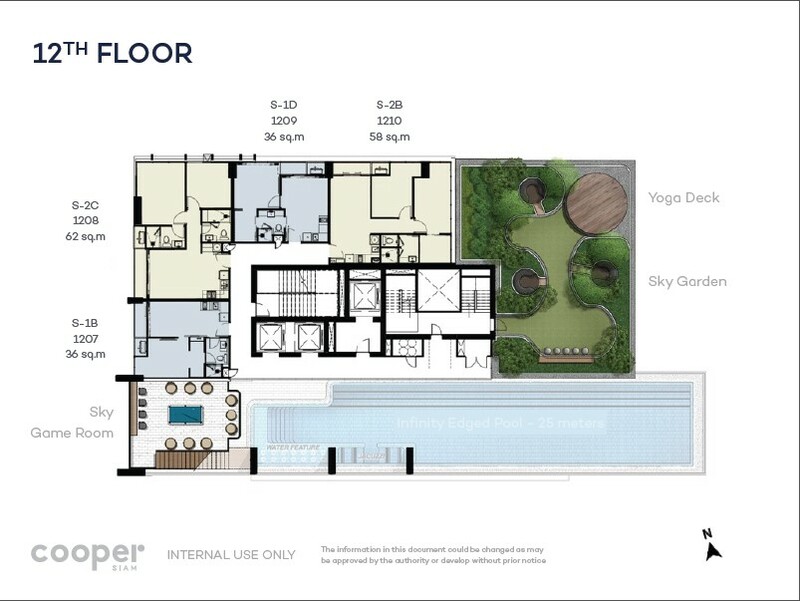 Which have been helping other project like Best Western BluPhere, FynnSukhumvit 31 and U Gallery Hotel. 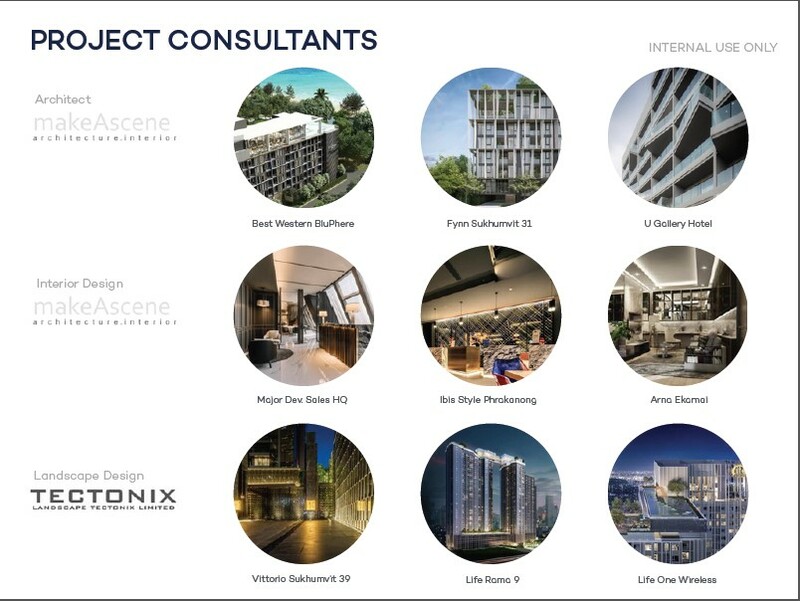 The project consultants of Landscape Design is TECTONIC DESIGN which have been helping to create a sustainable design and using sustainable materials in each project they have worked with like Vittorio Sukhumvit 39, Life RAMA 9 and Life One Wireless. 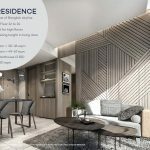 For those who are interesting in the project, can visit the website to read about more information and register to get special offer and also other news at http://coopersiam.com/ Tel. 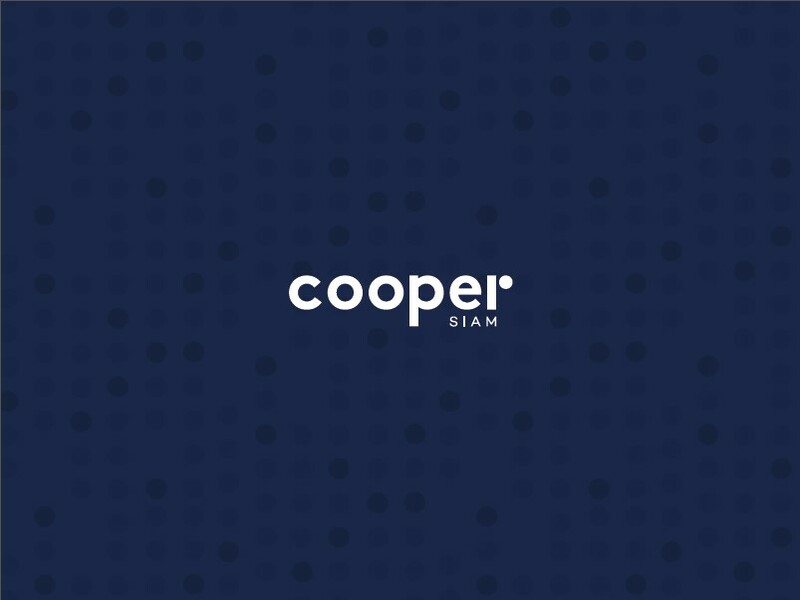 089-459-5399 and LINE @CooperSiam The project will be on the Pre Sales this February. 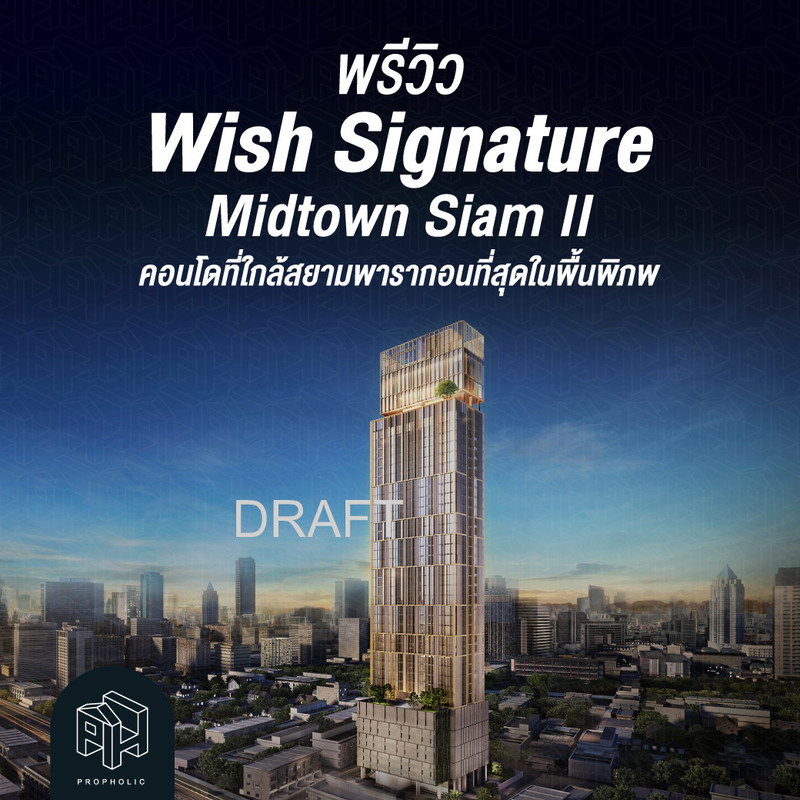 Preview of Wish Signature ii Midtown Siam. 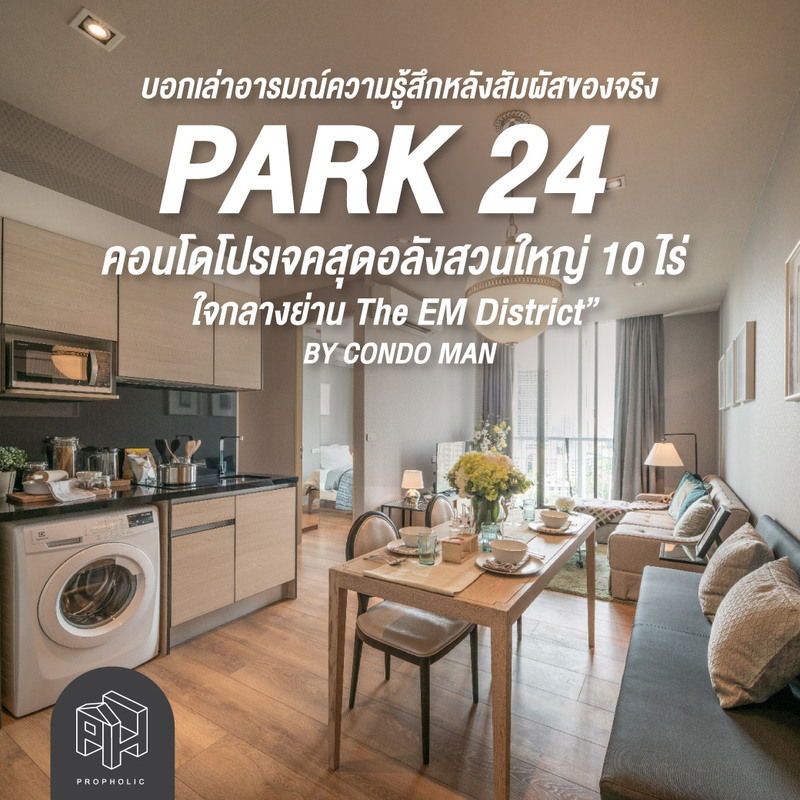 The condo located nerest Siam Paragon ever! 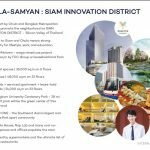 Mr. Nuttaphong Kunakornwong, Chief Executive Officer of SC Asset Corporation PCL (SC), Thailand’s leading real estate developer, signed a memorandum of understanding with Mr. Bandit Saphianchai, President of BCPG PCL, one of Asia-Pacific's leaders in renewable energy, to develop “Sun Share Project”. 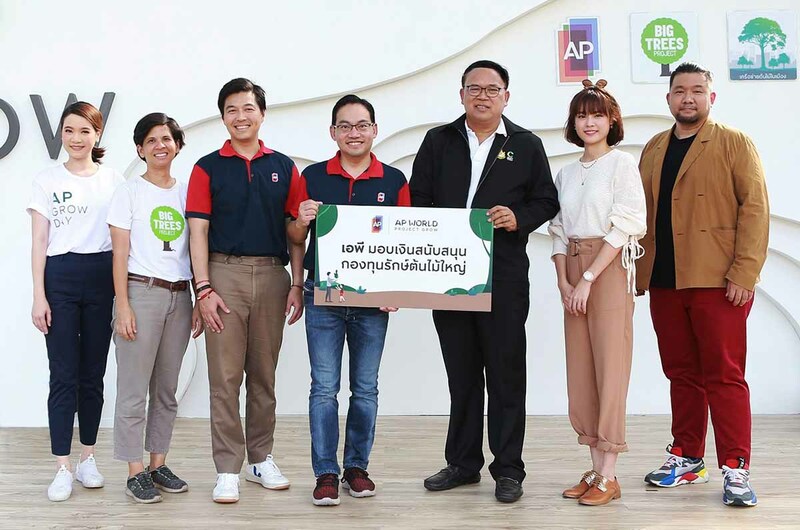 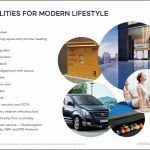 AP (Thailand) Public Co., Ltd., the leader in the development of residential properties and innovations, is elated with the company’s presales for the first quarter of the year. 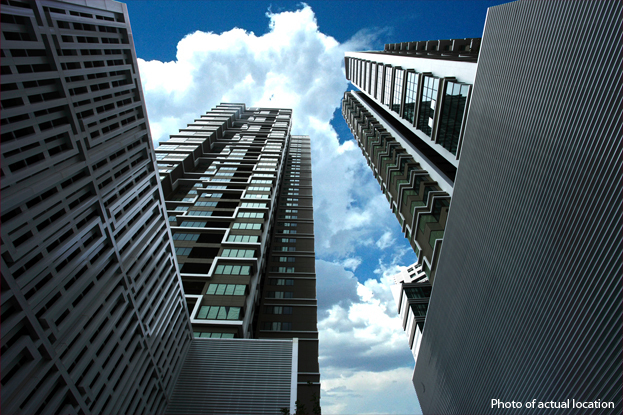 Demand was strong for both low-rise and high-rise products, allowing it to record presales of Bht 12,585 million for the period. 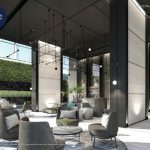 As a result, the company has reached 30% of presales projected for the entire 2019 at Bht 41,800 million. 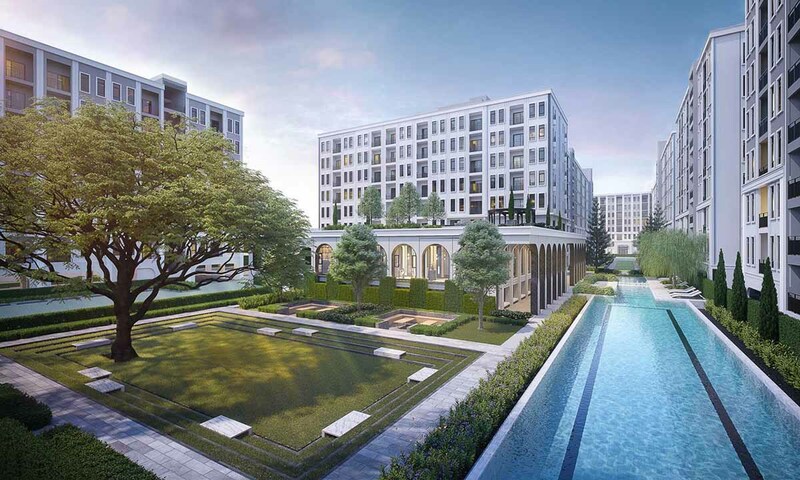 The firm is confident that in the second quarter, the real estate market will continue to have a strong demand for properties in the middle-to-high end segment as it is poised to launch 13 new projects worth Bht 19,720 million.